Costly medicines mean debt or death for people with hepatitis C.
People living with hepatitis C, International Treatment Preparedness Coalition - India (ITPC-India), and treatment activists at a press conference held recently in Delhi, questioned the silence maintained by the Indian Health Ministry on its response to the Hepatitis C virus (HCV) which is emerging as a growing public health threat, and in the absence of effective prevention programmes, millions are at risk of this deadly infection. According to the World Health Organization, hepatitis C virus (HCV) is a major cause of acute hepatitis and chronic liver disease. Globally, 3 to 4 million persons are newly infected each year. The Viral Hepatitis resolution adopted by the member states of the World Health Organisation on 23 January 2010 at the Sixty-third World Health Assembly, recognises Hepatitis C as a public health issue. The burden of the disease in India is expected to continue rising in the absence of prevention and harm reduction measures with vulnerable communities. According to the health organisations, there are two main obstacles to an effective HCV response in the country. First is the absence of prevention efforts; second is the lack of political will to treat HCV-among policymakers in the Health Ministry. "HIV and hepatitis viruses are transmitted in similar ways and it makes public health sense to link HCV prevention efforts to HIV programme" said Eldred Tellis, Director of Sankalp Rehabilitation Trust. "In addition to HCV screening in blood banks, prevention and harm reduction efforts for HIV and HCV with vulnerable communities should go hand in hand. Unless this is done, HCV infections will rise in India even though HIV transmission rates reduce, particularly among injecting drug users (IDU), the most vulnerable community," adds Tellis. Currently, HCV treatment is a combination of two drugs, pegylated interferon and ribavirin. For people who develop chronic forms of the disease, treatment is currently unavailable in the public healthcare system and unaffordable in the private sector. The high cost of HCV treatment in India (cost ranges from Rs. 14,000 to 18,000 per dose) is attributed to the absence of generic competition due to patent barriers. India, as part of its obligations under World Trade Organization's (WTO) international trade rules, had to introduce product patents on medicines in 2005. Pegylated interferon alpha 2a and alpha 2b, used in the treatment of Hepatitis C, were among the first set of drugs to come under patent monopoly in India, blocking the development of its more affordable generic versions. "I had to use all my savings and borrow heavily to pay over seven lakhs rupees for my 48 week HCV treatment," said Nanao Haobam. Neini Wanda E. Pakma, who underwent HCV treatment this year, adds, "my family had to pay Rs.5, 78,000 over 24 weeks for just pegylated interferon. I am one of the lucky ones to have been successfully treated in India. 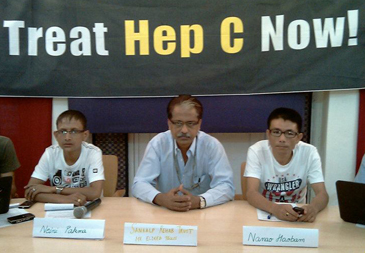 The high cost of drugs makes it impossible for patients in India with chronic HCV to get the treatment they need." The participants felt that the government has been moving far too slowly on addressing the problems of patients who need HCV treatment. "When drugs are patented, and pharmaceutical companies fail to fulfil their obligation to make patented medicines available and affordable to patients, the only way to bring prices down is through examining the validity of the patent granted or compulsory licensing which allows generic production of more affordable versions," said Loon Gangte, of the Delhi Network of Positive People (DNP+). According to Dr.Tokugha Yepthomi, of ITPC – India, "As a physician I have gone through the frustration of watching people die of AIDS even when effective anti retrovirals existed. But things changed with domestic production of affordable generic antiretroviral medicines.People are now dying because the price of the HCV drug that can save them is too high. Prohibitive pricing of lifesaving medicines by pharma companies is unethical and unacceptable." Compulsory licensing (CL) could be a way out to effectively reduce the prices of Hepatitis C medicines. The case of the CL issued by Thailand for the AIDS drug lopinavir/ritonavir in January 2007 clearly illustrates this. Over the course of one year, the price decreased by as much as 75%. India's Patents Act too allows it to implement a progressive compulsory licensing policy in accordance with international trade rules. The situation, although brushed aside under the carpet, is already bad. It is high time for the Indian government to take immediate action.